On December 22, 2009, the "STRIKE" Brigade received orders to spearhead the new surge of forces into the southern region of Afghanistan in support of Operation Enduring Freedom. The 2nd Brigade Combat Team (BCT), 101st Airborne Division, Air Assault - Combined Task Force (CTF) STRIKE deployed in support of Operation Enduring Freedom (OEF) X-XI from 10 May 2010 to 30 May 2011, as the main effort brigade of the President's "surge" force in Afghanistan. CTF STRIKE conducted a comprehensive counterinsurgency strategy in Arghandab, Zharay, Maiwand, and Panjwai'i Districts, Kandahar Province, to defeat the insurgency and improve the security situation in the "militant birthplace of the Taliban." CTF STRIKE simultaneously developed and enabled the Afghan National Security Forces (ANSF) and district governance to assume control in the region. During the year-long deployment in Southern Afghanistan, STRIKE defeated the Taliban in these critical districts and established over 29 combined Coalition and ANSF bases in Taliban contested areas. The STRIKE Brigade, partnered with the 3rd Brigade, 205th Corps Afghan National Army, built key governmental infrastructure including schools, roads, medical clinics, canals, and irrigation systems that improved the quality of life of the Afghan people. Combined Task Force STRIKE extended governance into previously inaccessible areas establishing district administration, health and educational services, and providing the people of Kandahar Province a voice in their government. 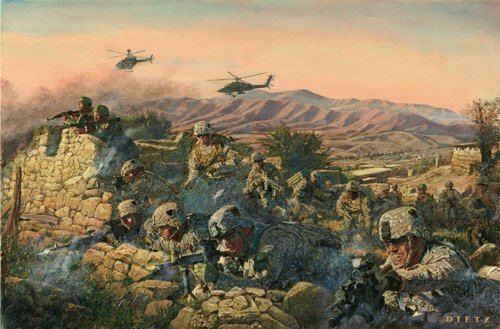 During the deployment, Combined Task Force STRIKE was comprised of 17 American, NATO, and Afghan Battalions, and it effectively reduced violence along major civilian supply routes by attacking the insurgency deep in historic enemy-held terrain. Combined Task Force STRIKE employed innovative techniques to breach and bypass insurgent IED minefields with the use of mine clearing line charges (MCLCs), anti-personnel obstacle breaching systems (APOBS), precision strike capabilities, and tactical explosive detection dog teams (TEDDs). STRIKE's use of persistent intelligence, surveillance, and reconnaissance platforms prevented the reemergence of the Taliban in the critical terrain. The actions of CTF STRIKE resulted in the significant reduction of Taliban influence where hostile activity the area of operations dropped significantly and allowed for greater engagement of the population by ANSF and local government leaders. Success in Kandahar Province provided the Afghan people the choice to support the Government of the Islamic Republic of Afghanistan and the opportunity for peace and prosperity in the future. CTF STRIKE's deployment in Afghanistan saw the award of a Distinguished Service Cross, 5 Silver Stars, 38 Bronze Star Medals with Valor, 111 Army Commendation Medals with Valor, and 491 Purple Hearts. CTF STRIKE executed more than 7 major operations during which 65 STRIKE Soldiers made the ultimate sacrifice. In recognition of their efforts under extreme combat situations, the STRIKE Brigade Combat Team was awarded the Presidential Unit Citation (PUC) for OPERATION DRAGON STRIKE and operations in Kandahar, as well as a Valorous Unit Award for the deployment. 1st Battalion, 320th Field Artillery Regiment, an Air Assault field artillery battalion serving as a provisional infantry battalion (Combined Task Force TOP GUNS), received the Presidential Unit Citation for their actions from 13 July 2010 to 15 September 2010 to remove Taliban insurgents and unify the Arghandab District, Kandahar Province. 1st Battalion, 502d Infantry Battalion, Combined Task Force TALON, received the Valorous Unit Award for their actions to remove hardened Taliban fighters and supporters in eastern Zharay District from September to November 2010. "I am a STRIKE Soldier: I fight where told, and win where I fight!"